Get ready to hit the stage with one of the greatest band in the world! Love classic slots? Love rock? Then Motorhead is for you! In 2016, NetEnt took three famous bands on a world tour with its Rock Trilogy. You may wonder why we’re talking about a 2016 game in 2018. Well, as it turns out, Motorhead is still one of the best slots you can play today. Plus, online casinos PA are just starting to offer it. So, we thought you’d want to know more about it since you’re probably a fan of the band like everyone! Granted that all three games have much to offer. In fact, experts say that NetEnt had a different target group in mind when conceptualizing each slot. So, want to know why you should play this game instead of the other ones? Read what’s next and get ready to rock! 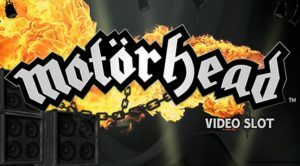 Summary of Motorhead video slot features. Feature: Free Spins bonus game, Symbol substitution, bomber feature mystery reels and rock mode. Pros and Cons for playing Motorhead video slot. What’s great about Motorhead video slot? In a word, Motorhead is a classic slot that has 76 paylines. The reels have an unusual layout, so it’s a great slot to play if you’re looking for a change and if you like classic slots. Also, it’s worth knowing that the game features we’ve listed above are both triggerable in the base game and in the Free Spins bonus.And the paytable is clear and will give you all the information you need on how the bonuses are triggered. All and all the Mystery reel feature truly adds to the game because when it’s active, you’re guaranteed to have at least one reel filled with identical symbols. Of course, as for most games, you’ll need to match three identical symbols from left to right on a payline to win. But, know that the Mystery reel features increase your chances of hitting a winning combo. What’s not so great about Motorhead? In our opinion, even if this slot is an excellent homage to the band, we think it’s likely that some female players (unless they’re massive fans of Motorhead) won’t like it since it’s a very masculine slot. Also, since the reels of this game are a bit unusual, it might take you some time to learn to spot the paylines. That is unless you’ve played Dazzle me before, which is a slot that uses the same layout. Motorhead has a fantastic soundtrack, and just to spin to the sounds of Ace of Spade, it’s worth a try! Know that this game is available on cells, tablets, and PCs. Most online casinos like Parx and PlaySugar House have an in-browser play functionality, so you won’t need to download anything on your device to play it. Additionally, you’ll be happy to know that Motorhead has both a fun mode (virtual coins) and a real money mode. So, What’s keeping you here? Head over to one of the casinos we’ve listed on this page to try it! Have fun!